A new brief from the National Home Visiting Resource Center highlights the importance of father involvement in young children’s early development and learning – and offers strategies home visiting programs can use to engage them. Father Engagement in Home Visiting: Benefits, Challenges, and Promising Strategies notes early involvement produces measurable benefits to the father, his partner and the child. These benefits occur regardless of whether the father and child live together. Despite the evidence, home visiting programs face barriers in successfully engaging fathers according to the brief. 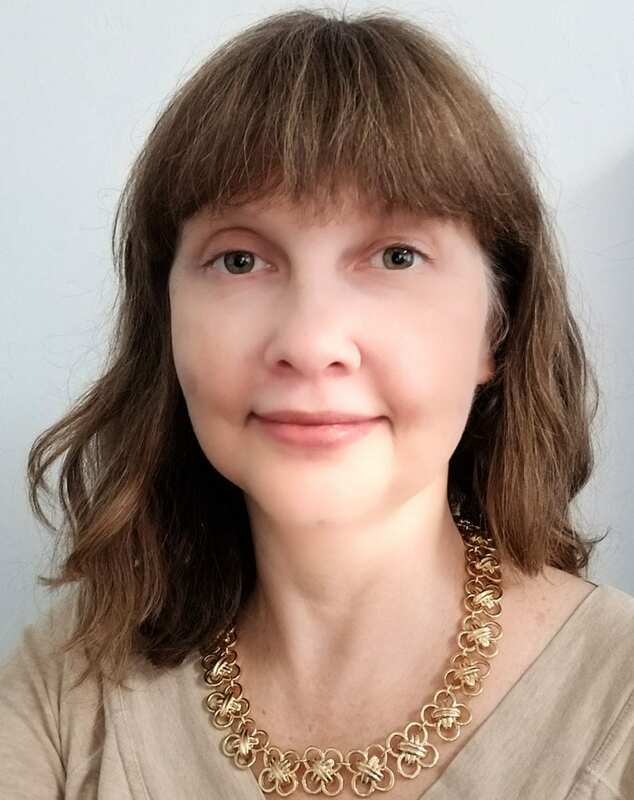 These include misperceptions that program are only for mothers, concerns about safety issues, scheduling issues and inadequate curricula and training to help staff address the needs of both parents. The brief outlines five promising strategies home visiting programs can use to overcome barriers and profiles available curricula supporting fathers. FL MIECHV’s CQI efforts are featured in a new HRSA publication, “Lessons from the Field: Using Performance Data to Inform CQI.” This resource highlights the integration of performance data into CQI processes using case-specific examples from Florida, Illinois, and Wisconsin. The publication includes strategies used by the states in forming a CQI team, selecting a topic for improvement, developing a SMART aim, using data, and promoting peer learning. It also includes a toolkit to guide CQI activities. Learn more about FL MIECHV’s CQI work here. Completed Depression Referrals went from 9% to 23%. The annual performance report highlights program activities in six benchmark areas: Maternal & Child Health; Child Injuries, Abuse & Neglect and ER Use; School Readiness & Achievement; Domestic Violence; Family Economic Self-Sufficiency, and Coordination and Referrals. The 2018 submission continues progress posted in prior years in both performance and data completeness. In FY 18, FL MIECHV faced its greatest challenges in working with families to achieve self-sufficiency, specifically primary caregiver education and maintaining health insurance coverage. The statewide initiative supports the implementation of three evidence-based home visiting models (Healthy Families Florida, Nurse-Family Partnership and Parents as Teachers) in 25 high-need communities and four contiguous areas. These sites provided 29,220 home visits to 2,550 families in 2018, including 1,086 pregnant woman and 2,165 children. Nearly three-fourths of program participants had incomes below the federal poverty level. Federal funding for evidence-based home visiting and early childhood systems development is provided to states based on needs and past performance. Florida’s program has been administered since 2013 by the Florida Association of Healthy Start Coalitions (FAHSC). FL MIECHV Demographics & Service Utilization Report 2018 and FL MIECHV Performance Measurement Report 2018 summarize aggregate data for local sites. Site-specific reports are also provided to local programs to help inform their quality improvement activities. In the coming year, state CQI efforts will focus on Safe Sleep, Early Language and Literacy/Parent-Child Interaction, Parent/Caregiver Depression, and Family Engagement (Enrollment, Home Visit Completion, Retention). More than 10% of babies born in Florida in 2017 were born too soon, earning the state a “C” on the Premature Birth Report Card, released today by the March of Dimes. The overall U.S. preterm birth rate rose to 9.93% of births in 2017 from 9.85% in 2016, according to data from the National Center for Health Statistics (NCHS). Preterm birth— before 37 weeks gestation– is the leading cause of infant death in the first month of life. Babies born prematurely are at higher risk of mortality and morbidity, as well as developmental delay. FL MIECHV sites that provide services to mothers prenatally annually report the number of babies born preterm. Preterm birth rate is considered a system measure since it is influenced by a myriad of social and community factors beyond home visiting. In 2018, FL MIECHV sites reported a preterm birth rate of 10.7%, compared to 12% in the prior year. Home visiting programs funded by MIECHV address preterm birth by focusing on key risk factors associated with prematurity and other poor birth outcomes. These risk factors include perinatal depression, intimate partner violence (IPV) and tobacco use during pregnancy. 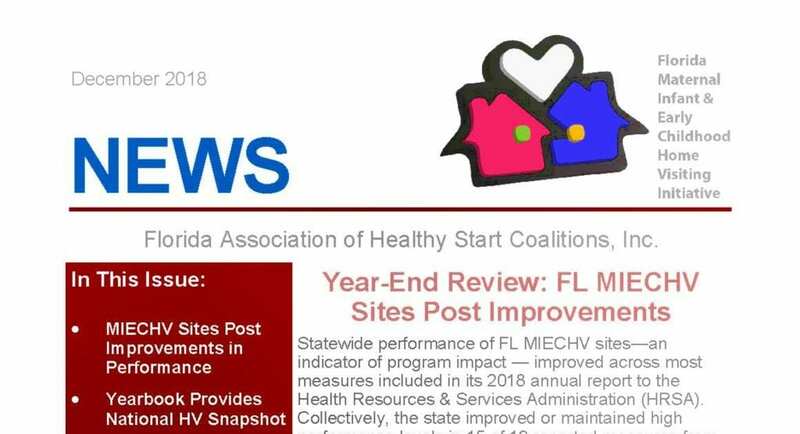 Performance on these measures by sites implementing one of three FL MIECHV-funded evidence-based home visiting models (NFP, HFF or PAT) is tracked annually and reported to HRSA. The March of Dimes will hold its annual Florida Prematurity Prevention Summit September 29-30 at the Tampa Westshore Hilton. Register now to hear national speakers and learn more about community-based efforts to reduce preterm birth. FL MIECHV is a sponsor of the conference. The federal Health Resources and Services Administration (HRSA) released a new resource today for home visiting programs working with families impacted by opioid epidemic . HRSA’s Home Visiting Program: Supporting Families Impacted by Opioid Use and Neonatal Abstinence Syndrome provides detailed information about the opioid epidemic, opioid use disorder (OUD), and NAS. It includes relevant research; offers strategies for MIECHV awardees and their state partners in early childhood, public health, and substance misuse and mental health treatment; and highlights promising efforts underway in several states. Florida has experienced a 10-fold increase in NAS rates from 2002-2012. It is estimated that one NAS infant is born every 25 minutes. These trends have implications not only the care of these infants, but also for the burden and costs for both families and the health care system. Approximately 80% of hospital charges for NAS are covered by state Medicaid programs. The FL MIECHV funded Parents as Teachers program in Pinellas County focuses on substance-involved families and collaborates closely with Operation PAR, a local treatment program. The state Home Visiting Advisory Council will receive an update on new federal Child Abuse Prevention & Treatment Act (CAPTA) requirements for plans of safe care, and the role of home visiting in providing follow-up support to families with babies experiencing NAS. The Council includes representatives from the state’s major home visiting programs, as well as state agencies working in public health, child protection and early learning. The meeting will take place November 2 in Tallahassee. 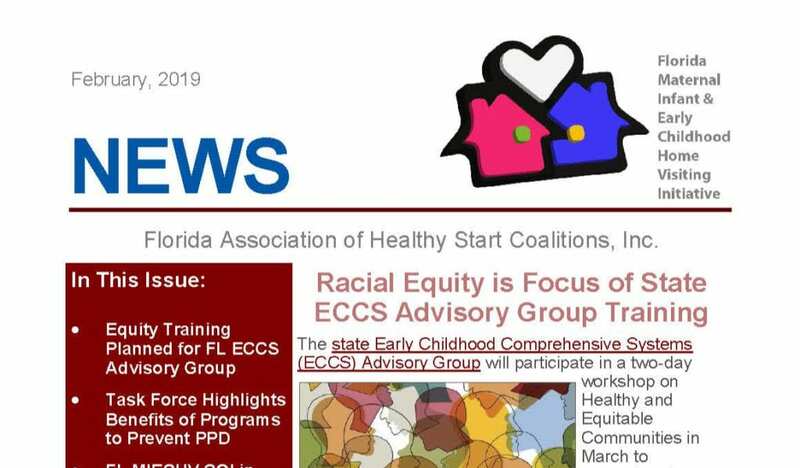 The FL Early Childhood Comprehensive Systems (ECCS) Impact initiative is seeking a place-based community to lead local systems building activities aimed at demonstrably improving developmental outcomes for children age 0-3. Interested applicants must document experience in implementing a place-based approach to address community needs, with a particular focus on children age 0-3; have established partnerships with key early childhood providers; and, be committed to using a racial equity lens in their work. Responses to the Request for Participation (RFP) will be reviewed and scored by an external objective review panel. An informational webinar will be held on October 25th at 9:30 a.m. to review the goals of the initiative and the RFP.